The NVIDIA Tegra 3 (T30) is a quad-core processor for tablets and smartphones that was introduced at the end of 2011. It features four fast clocked Cortex A9 cores and a fifth companion core clocked at 500 MHz to save power (4-Plus-1 architecture). The 5th core is manufactured with low power transistors and running on a seperate power plane. The clock speed of the four cores can reach up to 1.6 GHz (depending on the version and core load). A single core can reach 100 MHz higher clock speeds (up to 1.7 GHz currently). 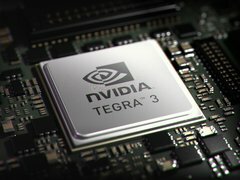 The integrated Geforce ULP is similar to the version in the Tegra 2 and offers 4 more vertex shaders and some small improvements. A bottleneck of the SoC is the 32 Bit memory interface altough it supports up to 2 GB DDR3-1600 / DDR3L-1500 / LPDDR2-1066. The included video decoder is able to play back 1080p HD videos with a bitrate of up to 40 Mbit/s. It supports the codecs H.264, MPEG-4, DivX, WMV and VC-1 (altough you need software like the Dice Player to use the hardware acceleration).